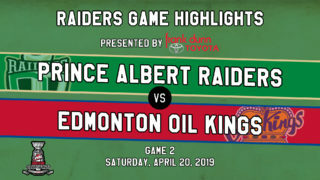 Prince Albert, SK – The Prince Albert Raiders (2-2-0-1) are heading into the regular season with some momentum after earning a 5-2 win over the Saskatoon Blades (6-1-0-0) on Saturday night at the Art Hauser Centre. 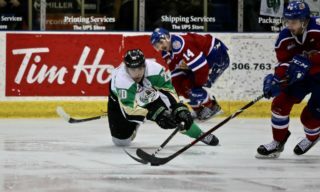 It was the Raiders’ second win in as many nights and put an end to the Blades’ undefeated pre-season stretch. Brett Leason got the scoring starting 7:51 into the contest with a shorthanded marker. 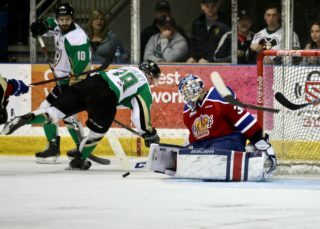 After Sean Montgomery forced a turnover in the neutral zone, Leason took the puck and beat Nolan Maier five hole for his third of the pre-season. Less than 20 seconds later, Emil Malysjev tied the game for the Blades with a power-play marker. Leason restored the Raiders’ lead before the end of the frame. He wired a shot past Maier to make it a 2-1 game with 7:17 to play in the first. The Raiders increased their lead early in the second. Kody McDonald’s centering pass was deflected by Spencer Moe’s skate past Maier to put the home side up 3-1. The Blades cut into the lead at the 7:10 mark when Aidan De La Gorgendiere snapped a shot past Donovan Buskey. From there out, it was all Raiders. Max Martin solved Maier from the half boards 50 seconds after De La Gorgendiere’s goal. With 5:21 to play in the frame, Moe tallied his second of the game to round out the scoring. Buskey wasn’t busy in the third period, turning aside all five shots fired his way by the Blades. He made 21 saves overall to pick up his first win of the pre-season. Maier allowed five goals on 35 Raider shots. Now, the games count. 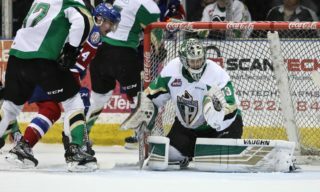 The Raiders open the 2018-19 WHL Regular Season on Friday, September 21 when the Regina Pats visit the Art Hauser Centre. 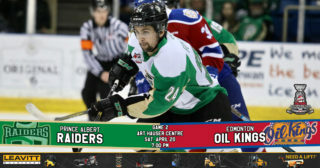 Single-game tickets are now available at raiderhockey.com.